Dynamix - Teambuilding for Kids and Teens! : How to kick start the school year! My Top 3!!! It happens every year, but with each passing year the summers seem to get shorter and shorter! Once again, school is just around the corner. In less than 2 weeks the desks will be full of books and supplies, the walls covered in posters, and the seats filled with students. So what are the best ways to kick off a new school year?! Make it a big celebration with a school CARNIVAL! Make a Time Capsule with your class on the first day. Break the Ice with fun and silly games. 2) Have each child fill out a short worksheet. This is where you should get creative. The best worksheets are the ones that have tasks that fit your grade level. This way students can see the progress they made by the end of the year. Some ideas: a handwriting sample, a tracing of their hand, a self-portrait, a logic puzzle, pop-culture questions, personal interest questions, etc. 3) Place each student’s sheet into the time capsule. Once they are all collected seal the time capsule and have a short ceremony to ‘bury’ the time capsule (i.e. put it in a drawer for the year). Note: If you put the right questions on the worksheet, you can open the time capsules that night and learn a little bit about what your students like and what their abilities are! 4) At the end of the year you can have the students complete the same or similar worksheet. Open the time capsule to compare and measure their progress. 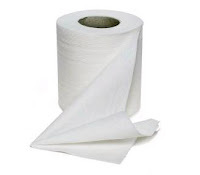 1) Take out one or two rolls of toilet paper and tell the students to “Take as much as you think you'll need.” This may provoke a lot of questions, but DO NOT say anything more than this. 2) Send the roll around the room, or you can send two rolls one at both sides of the room to help things move along a little more quickly. 3) Once all students have taken the amount of toilet paper they feel they “need,” collect the unused toilet paper. 4) Now going one student at a time, the students must share one fact about themselves for each square they ripped off the roll. LOVE the time capsule idea! Well consider this my time capsule prediction then. The Habs (Montreal Canadiens - for those not in tune with hockey lingo) will win the Stanley Cup in game 6 this year. Sorry, there was a typo in my comment. "...while *leaving* in Toronto..." should read "...while LIVING in Toronto..."
I guess my subconscious is telling me something!! Haha, just kidding!